‘Straight to the Heart of Solomon’ joins the popular series of devotional commentaries for lovers of fascinating Bible study and haters of garbled theology. His wish for readers is to hear the ‘roar’ of these books so they help you see the Lion and communicate with the Lion’s heart. Discover the books of the Bible, the originals authors’ intent, the Holy Spirit's work and the voice of God challenging you further in your Christian walk. Phil Moore leads Everyday Church in London, UK. He also serves as a Bible teacher and evangelist within the Newfrontiers family of churches. He is the author of "Gagging Jesus" and the "Straight to the Heart" series of devotional commentaries. Phil is married to Ruth and they have four young children. Together, they love eating strange and exotic food, watching movies with lots of popcorn, and reading books by Roald Dahl. Phil's children complain that his own books do not contain enough pictures, talking animals or chocolate factories. 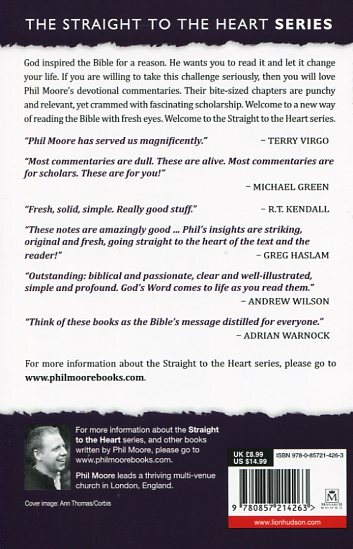 Straight to the Heart of Solomon by Phil Moore was published by Lion Hudson in April 2013 and is our 14228th best seller. 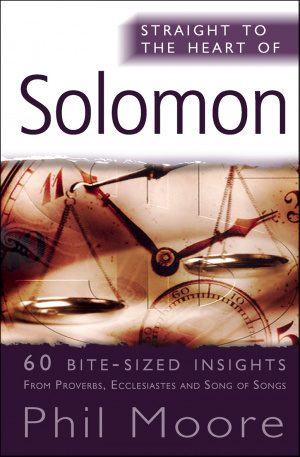 The ISBN for Straight to the Heart of Solomon is 9780857214263. Be the first to review Straight to the Heart of Solomon! Got a question? No problem! Just click here to ask us about Straight to the Heart of Solomon. A series of devotional commentaries, which allow people to get to grips with each book of the Bible one bite at a time. Phil Moore focuses on key sections of each book. There will be 25 volumes in all. Although the tone is light, the text is full of useful application and backed by substantial scholarship.